What seemed like an elegantly simple idea developed in the brain plasticity labs at Boston University 3 years ago has become a force for personalized, precision medicine for speech and cognitive therapy. After years of researching different types of therapy for clients with aphasia after a stroke, Swathi Kiran, PhD, CCC-SLP, organized a group of technologists to "digitize the therapy" and take all of the clinically proven therapy content on flash cards, workbooks and papers and program it to be delivered on mobile devices. Thus Constant Therapy, a program that delivers over 64 different types of cognitive and speech therapy exercises in 60,000 variations, was born. The thesis was that every patient is different and requires a personalized therapy regimen based on who they are, their diagnosis and the progress they are making towards their recovery goals. All of the content was, for the first time, available in one place. The exercises were more engaging and voluminous. The therapy could be delivered in the clinic and automatically at home. Individual performance could be tracked down to the sub-segment of cognitive domain. Patients and clinicians could see the results and improvements for the first time. 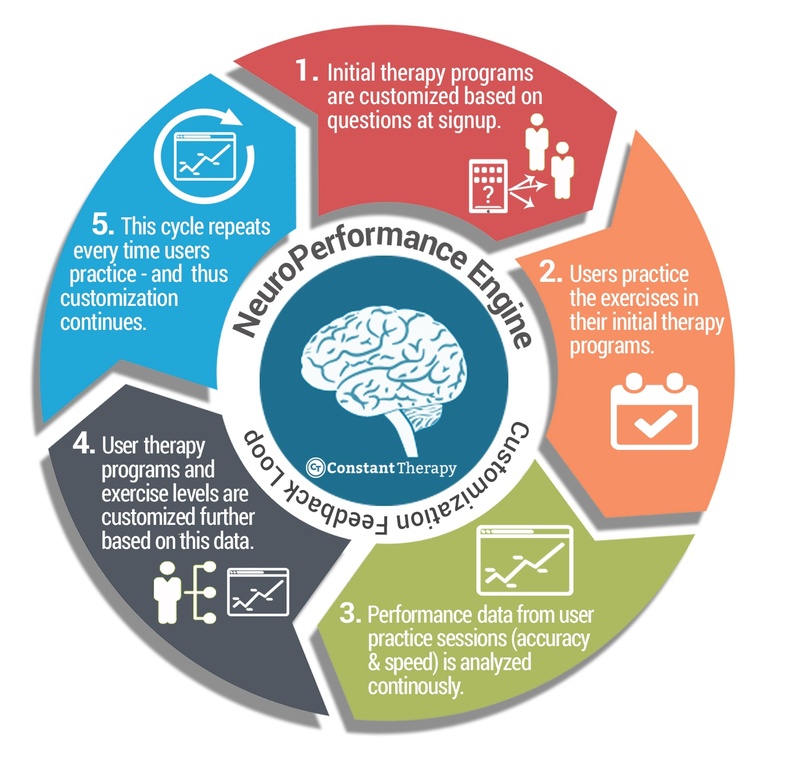 The NeuroPerformance Engine uses large sets of data and algorithms vetted by neuroscientists and clinicians to deliver recommended therapy exercises to brain injury survivors. These exercises are designed to meet the therapy criteria for the clients' specific injuries and demographics. A new client working with a clinician downloads the Constant Therapy App on a tablet and fills out demographic and diagnostic information. The technology searches the database of people who fit the same profile and decides on the most appropriate cohort. The program then analyzes what therapy content actually worked to improve cognitive and speech functions for that cohort of people and automatically recommends specific exercises in different categories and difficulty levels that are the best match. As the client continues to complete the exercises, the engine adjusts the therapy content based on factors such as accuracy, speed and cues requested. This "AutoAdvance" feature continues for as long as a client uses the program over months and years. Constant Therapy's only goals are to help clients improve their core life skills and help clinicians to use the program and the data to further their exceptional work with their clients. One way that "success" in client improvement is measured is by analyzing the suite of functional exercises offered . those exercises that measure readily transferable skills to everyday life. Things like reading comprehension, telling time, selecting items from a menu, listening to a voicemail and understanding the main messages, following a map and directions, etc. These are all practiced exercises which, as remastered, help clients get back to the activities they enjoyed prior to their injury. The best measure, however, of whether a client is improving is the direct feedback from clinicians, caregivers and the clients themselves. This type of feedback keeps our team motivated to keep working to improve our scale and effectiveness. There are certainly limitations to this type of therapy. First and foremost, there is no substitute for a well-trained clinician who has studied the science and has seen so many clients that intuition and other measures of assessment and treatment are used. In fact, we decided years ago that we were going to include these clinicians in product design and delivery. These therapists use Constant Therapy with their clients in their office, help design the best therapy for home use and then have full visibility through the product into usage and performance of their clients at each visit. We also decided we were not going to try to totally reinvent what therapy brain injury survivors received . we use only therapy content that has previously proven to work through clinical use and studies. The increased therapy hours that are logged as a result of the in and out of clinic availability of the content. The more engaging interface and interactions with the content. The efficiency gains for clinicians working with their clients. The ability for clients to continue therapy after their insured visits with a clinician end. The data that shows encouraging progress and areas in need of work. The use of the data and technology to amplify the science, not replace it. We are only at the beginning of enabling precision and personalized medicine for these applications. We have clinical trials ongoing and being designed for MCI Alzheimer's Disease, epilepsy, TBI and other conditions. But we are certain of this: the smart combination of people, science, technology and data can yield incredible results for neurological disorders.